1) the trio has been playing together regularly for three years, longer than any other ensemble I’ve put on record (not counting the collaborative band T.J. Kirk). We play a repertoire written for this group, that is, for John Hanes, Dan Seamans, and myself. The songs are “lived in”, for sure. 2) working with producer Hans Wendl, the first time I’ve had a producer for one of my own records. I’ve known Hans and his impressive body of work for at least twenty years, and worked with him recently on Sarah Wilson’s to-be-released record Kaleidoscope. I felt there was a family resemblance between the trio’s music and Sarah’s record, and so it just sort of flowed out of that. He was crucial to the success of the recording, to hear the whole trio from above, as it were, thus giving me some space to concentrate on the guitar playing. 3) a guitar, bass, and drums trio record. of original music. sans effects, minimal editing. live. from which the question arises: do I really have something that must be said in this regard? I simply would not want to release something that could not more or less hold its own with the guitarists and records I admire. I think that making a record in this manner – one day live in the studio – severely exposes a musician. But – what a great thing, to be exposed! 4) Going outside my normal practice of recording at one of two studios operated by close friends. 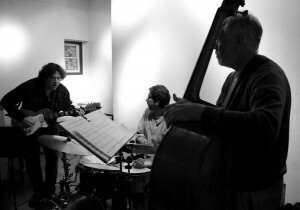 Guerrilla Recording and New, Improved have been recording homes for me for a long time, and I really cherish the work I’ve done there, with Myles Boisen, John Finkbeiner and Eli Crews. For this recording, I wanted to be in that incredible room, Fantasy Studio A, where Sonny Rollins and Bill Evans and mentors of mine like Jerry Granelli and Julian Priester have recorded. To give the drums that warm, spacious sound that lets them fully speak, lets them breathe, lets them sing. We worked with engineer Adam Muñoz, who is to engineering what Marc-Andre Hamelin is to pianos: a virtuoso’s virtuoso. This entry was posted in Recordings, new and used and tagged actual trio;. Bookmark the permalink.